~*West End Designs Knits*~: New Pattern!! Welcome to my knitting blog! Pull up a chair and join me in a chat about everyone's favorite topic...KNITTING! Feel free to leave me a comment or send me an email! but being “gardening challenged” growing the real thing became impossible. Now, no gardening care is necessary and I can still enjoy the beauty of the desert!! Cast on 46 stitches with one strand of each of the green yarns. Entire cactus is worked with double strand throughout. Place marker and join taking care to ensure stitches are not twisted. Drop darker green and attach yellow yarn, continuing to work in double strand throughout. Drop lighter green and attach another strand of yellow, continuing to work in double strand throughout. Approximate finished dimensions (before felting) 16 inches (at widest point) by 14 inches. Dimensions do not have to be exact as each cactus will be unique. Break yarn, attach tapestry needle and draw through remaining stitches to gather at top, pull tight and secure yarn. To finish, felt by desired method until no stitch definition is seen. Manually shape and stuff with plastic shopping bags to maintain desired shape. Air dry. 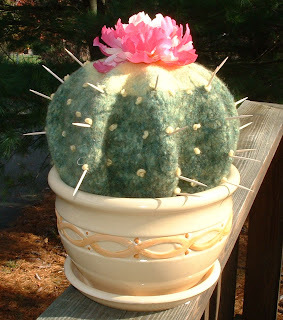 Add French knots in striped pattern down sides of “cactus” with yellow yarn, punch toothpicks through knots and into “cactus” for spines. Do NOT use toothpicks in homes with children or climbing pets. Attach flower to top (this can be omitted) and “plant” in decorative pot. be sold without the express written consent of the designer.